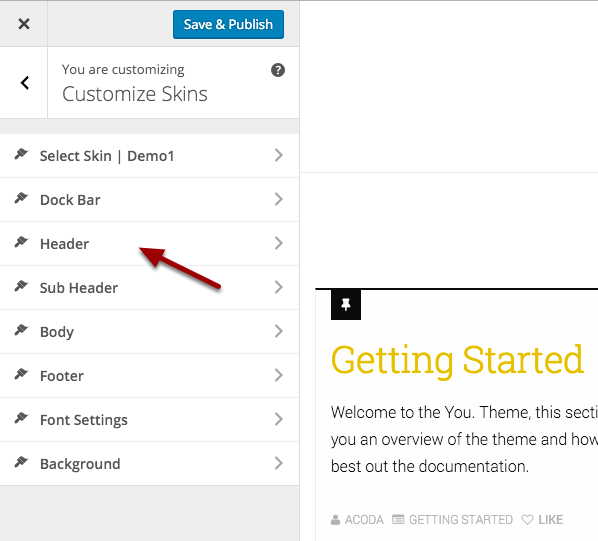 Watch the video tutorial for editing the Header Skin Settings here. Use this option to set an Alternative Logo to the one being used in the main admin settings – WordPress Admin > Customize > Header > Logo URL. The logo set here will only display on the Pages that have this Skin applied to it. Change the Background Color of the Header. This color will also set the the Main Menu Drop Menus ( This can be overridden using the Sub Menu Background Color – see option below ). Change the Background Color Opacity of the Header. This opacity only affects the color and not the background image. Use this option to set a Background Image. You can position the following settings to position the image. Use this option to set a Border Color on the Header. This option changes the Font Color within the Header. Use this option to change the text color of the Header Panel Widget and Logo Tagline. Please Note: This does not change the Dock Icon Colors, see below to change the color of Dock Icons. Use this option to change the color of links within the Header. This includes the Menu & Dock Icons when the Dock Bar position is set to Header. Use this option to change the hover color of links within the Header. This includes the Menu & Dock Icons when the Dock Bar position is set to Header. This option specifically targets the Main Menu Link Colors within the header. This overrides the Header Link Color ( See above ). This option specifically targets the Main Menu Link Hover Colors within the header. This overrides the Header Link Hover Color ( See above ). Use this option to set a Submenu Background Color, which overrides the Header Background Color value which the Submenu naturally inherits. Use this option to set a Submenu Background Opacity. Use this option to set a Submenu Link Color. Use this option to set a Submenu Link Hover Color. Use this option to set a Submenu Link Hover Background Color. When the Floating Header option is set to Float + Transparent , use this option to set the Header Font Color. When the Floating Header option is set to Float + Transparent , use this option to set the Header Link Color. When the Floating Header option is set to Float + Transparent , use this option to set the Header Link Hover Color.